I enjoy being frugal in all aspects of my life and beauty is no exception. So, I've been searching the internet for DIY beauty treatment the easiest I came across was homemade facial scrubs. One of my favourites was the gothically gorgeous Black Friday's skin lightening facial scrub. Also, this proves how out of touch I am with the viral community, I had no idea who she was until watching her videos. I personally prefer Youtube as a source of entertainment and ah, that's how you do it. Black Friday's vlog have provided me with many hours of excitement when cooking or the dreaded washing up. After using the scrub for a couple of weeks, I'm more than happy to recommend it. I've noticed a general improvement in my complexion and sense of wellbeing knowing what I'm applying on my face. It's hard to tell if my skin improvement is just down the scrub alone or whether it's combo of my new skin regime and avoiding coke. Unfortunately, I have every combination of skin imaginable including sensitive, oily and dry. Just to add insult to injury, I have suffered from acne prone skin from the age of 11 and still prone to spots at the age of 27 finding anything to work has been a nightmare. My new routine consists of using Boots' brand of Witch hazel and tree tea form (£3.50), then I use Nivea's Daily Essential Daily Essentials Sensitive 3in1 Micellar Cleansing Water (£3.69) mixed with Boots Tea Tree & Witch Hazel Cleansing & Toning Lotion(£3.50). For moisturiser, I use a combination of Boot's baby castor oil & zinc and Nivea's soft posting cream. The castor oil and zinc (£1.59) feels greasy when applying, it appears to soothe my skin, it doesn't really moisturise my skin in comparison to the Nivea soft that works. All prices are based on Boots' prices, all except the moisturiser I get from Poundland. Now, I wanna chat about makeup, I'm one to talk. since I only small makeup bag worth. So, I've started stocking up on my make-up. Below is my kitty make-up bag. As stated in previous posts, my style is sombre, unadventurous and pretty boring; the same goes for my make-up. I prefer the ethereal goth look style, and I take inspiration from Patricia Morrison's style rather than Siouxsie Sioux. I often purchase my eye shadows and pressed powders, the translucent powder suits my colour, from Poundland. 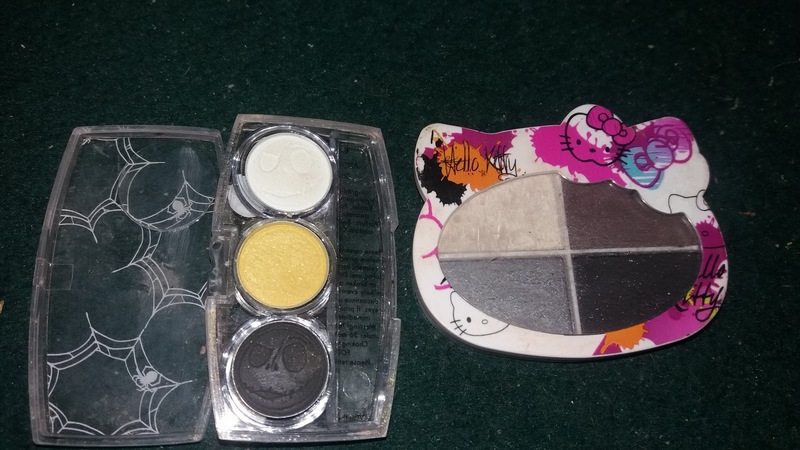 I also came across a Hello Kitty Halloween eye shadow and a Nightmare Before Christmas eye shadows. I've heard of cases where Poundland has sold out of date makeup but from my experiences I've never had problems. 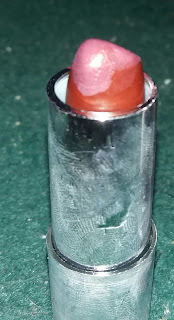 I rarely wear lipsticks because it never stays on longer than half hour, and I need to continually re-applying it. I picked up dark purple from Poundland, and Primark have started selling makeup, I purchased a gorgeous have a deep red known as crimson midnight, I bought it, just for the name alone. I think I have combination skin too, it's prone to pimples and dryness! Also crazy easy to irritate! Such fun! Love the Patricia Morrison look! Yeap, combination skin is the worst. I've tried all sorts of products, I even used to Clinique products, but they were far too harsh for my skin. Over the last two years, I've swapped to Nivea, surprisingly it's had the best results. I'd highly recommend the Nivea Sensitive 3in1 Micellar Cleansing Water, it works without being harsh, and the Nivea soft cream works fantastically without feeling too greasy. Both the product don't break the bank. I do like the Siouxsie Sioux's look and admire her makeup. I would love to be able to do backcombing and have birds nest. I've attempted it, looks rubbish on me. Long hair and birds nest don't compliment each other. I find her makeup is a bit too dramatic for my preference and facial features. I prefer her look as it's more to my preference. Nivea Soft is great - I have easily irritated skin and it works very well for me. I love Superdrug's own brand vitamin E body cream, also rather cheap. I used to back comb my hair a lot in the late 80's / early 90s. We used to use mousse, then scrunch it before backcombing with a tin of Hard Rock hairspray to get it rigid - my poor hair!! Patricia Morrison is beautiful. I look at other people's make up in awe - I can barely control an eyeliner pen! I do love bright red lipstick though, usually the Body Shop's. 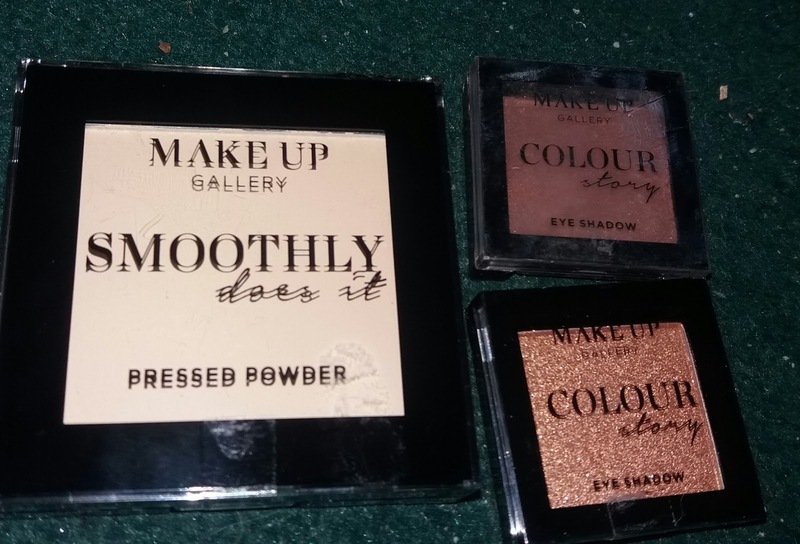 Superdrug's makeup, and Collection are pretty cheap and good quality for bases and foundation. One thing I can't find at the mo, any decent cheap mascara. My no means am I good at doing make-up, but I do have a steady enough hand doing eyeliner. I still have my mishaps with eyeliner , thankfully it can be fixed with cotton ear buds and moisturizer. I admire, any one who does fantastic eye make I attempt to do it but it always looks the same. I can't do much with my hair it has a mind of it's own it prefers being naturally straight with it kinks. I gave up styling. It same with hair dye my hair like being red but hates black. I've learnt to live with it. 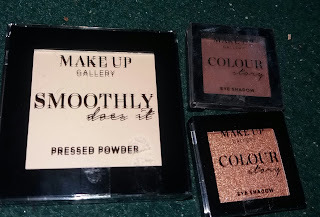 I never attempted to use any of the product from Superdrug, then again, I rarely go into it. I might have to check it our next time I'm passing it. Everything they do is cruelty free and decently priced; when I left my job I also had to leave my love of Neal's Yard moisturiser behind! £21 a tub is prohibitive - and it was so nice my husband kept stealing it!! I'm quite fortunate most of beauty products are reasonably priced except my foundation is No7 about £13 but I'm considering looking for something a cheaper as not happy with the colour or texture. My eyeliner is Mac cost £16 but it's the only one which doesn't irrate my eyes so that staying. It took me a long time to realise pinkish shades like those actually look great on me, I always thought they'd be super girly but they are great for shading, and easier to manage than pitch black! I tend to prefer or more browns and bronzes with golds. As they tend to suit my coloring. I'm v. pale with an olive undertone, surprisingly. I do also tend use some pinks and mauve.